“It’s about the size of a mouse turd,” says Diana Six, Professor of Forest Entomology/Pathology at University of Montana, when describing the Mountain Pine Beetle. Historically, the Mountain Pine Beetle contributed to a healthy forest by eliminating weakened trees, making room for new growth. Cold temperatures kept populations in check, only 20% of larvae would survive a winter. 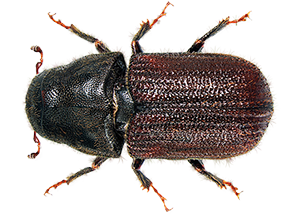 At higher altitudes, Pine Beetles may live for up to two years; however, most beetles complete a life cycle within one year. They go through egg, larva and pupa stages beneath the bark of a tree. When summer temperatures warmed sufficiently, adults emerged in search of a new host. Females lead the charge, emitting pheromones that beckon males to follow. Carrying a fungus in mouth pockets, it is released inside the tree when the beetles begin boring into it. The fungus grows, gathering nitrogen that supplies the beetles with needed food. A female will lay approximately 60 eggs. The fungus supplies nutrients to the growing offspring. The fungus invades the sapwood, preventing the tree from using pitch to repel beetles. It also blocks water and nutrient transport inside the tree. Pine Beetles are opportunists. When conditions are right, they colonize and reproduce. Now might be the beetle’s greatest moment in history. 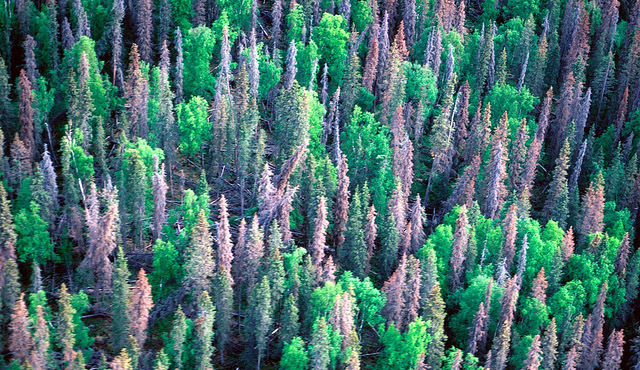 Mountain Pine Beetles have been devastating forests in Canada, trees at higher altitudes with no natural resistance. The insects aren’t picky when food source areas are depleted, they move on to another one. Ponderosa and other pines in Nevada County, stressed and weakened by drought, are feeling the bite. As disturbing as it is to see huge areas of forest turning red, a bright spot may be the survivors – genetic adaptors. These are trees that struggled in cooler, wetter conditions. The beetle blight is giving them an opportunity to flourish. 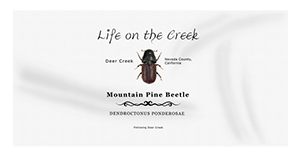 Mountain Pine Beetles don’t ‘see’ those trees as food. It is too soon to tell the effects that these species will have on animal habitats, water retention, and snow packs.